Hiking is one of our family's favorite activities. We love the fresh air, exercise, and family time! While both of my girls are pros now, I remember all the steps I took to get them ready for their very first hike. 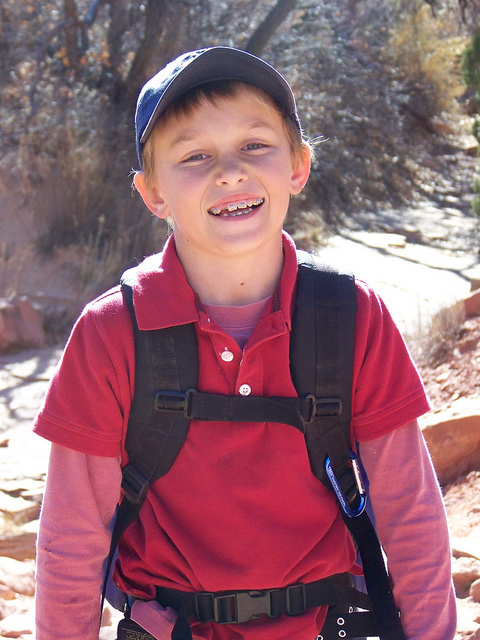 These tips can help you prepare your kids for a successful first hike, too. Before I had kids, I loved hiking long hilly trails. I knew my favorite trails were not toddler-friendly, though. Instead, I had to choose flatter, shorter trails my toddlers could handle. To find kid-friendly trails, ask other parents for advice, search hiking guides, or check out the AllTrails website. I know you want your child's first hike to be a positive experience, so time it carefully. Try to hike when your child has high energy, and avoid any interruption to nap time. I made the mistake of buying my older daughter new speakers before her first hike, and they gave her blisters. Ouch! The right shoes and protective clothing, including a sunhat, keep kids comfortable and safe as they hike. Be prepared for anything on your child's first hike - trust me! I suggest packing extra clothes, snacks, water, a first aid kit, bug spray, sunscreen, baby wipes, a blanket, and diapers, if necessary. I know it seems like a lot; if your kids are old enough, they can carry a backpack and share the load. My girls loved helping plan their first hike. Even though they were too young to pick the trail, they chose the color of their shoes and helped pack the snacks as they took ownership of their hiking experience. It's natural to hear loud birds or see snakes on the hiking trail, but newbie hikers can be freaked out about these natural phenomena. Be sure your kids feel comfortable in nature so they can have fun and enjoy the wonder of the outdoors. First hikes can be challenging for young kids. Plan to take several rest stops and refuel with water and a snack or explore an interesting site. Your child will then be reenergized and focused to keep moving. In the middle of my younger daughter's first hike, she grew tired and cranky. Luckily, I was prepared to play games. We counted squirrels, played I Spy, and sang silly songs. Games can help your child stay entertained and remain enthusiastic for the entire hike. Safety is a huge priority for me, so I taught my girls safety rules before we hit the trail. They knew to always keep me in their view, never stray from the trail, and leave no trace. These safety rules protect our kids and nature. Before your first official hike, try a short practice run or two. Use this practice hike to tweak your gear list and show your kids what to expect. I also appreciated trial runs because they helped my girls get excited for their first real hiking adventure! A child's first hike can be tons of fun and is a big accomplishment. Follow these steps as you prepare your child for success. What other tips would you recommend?